She brings to light...God is gracious: Day 10 - Gotcha Day! Where do I begin...I can't believe today just happened. Well if you were following our Facebook group page, you know that we had to wait a little longer than expected. The morning was moving slowly already - my tummy was getting upset from the nerves and Allan was pacing back and forth in our hotel room. Aggie called us a little after 10:30am and said she's right outside of our room door. We kind of panicked - we thought she may have Siana with her. But she didn't. She told us that Siana will be here around 12:30pm or 1pm. Bummer. Aggie and I headed to the plaza (it's like a big swap meet inside of a building) to find a stroller. I'm glad I had Aggie with me, as she negotiated the price with the seller much better than I ever could have. We came back to the hotel and the long wait just continued. Finally we received a phone call from Aggie (who was at the lobby) around 12:30pm. Aggie told us to come down, as Siana was about to arrive. I saw a lady holding Siana walk into the lobby as soon as we got off the elevator. Siana was already crying/screaming from all the commotion. She clung onto the lady (who Aggie said was the lady in charge of international adoption...I'm assuming for her orphanage or for this region?). 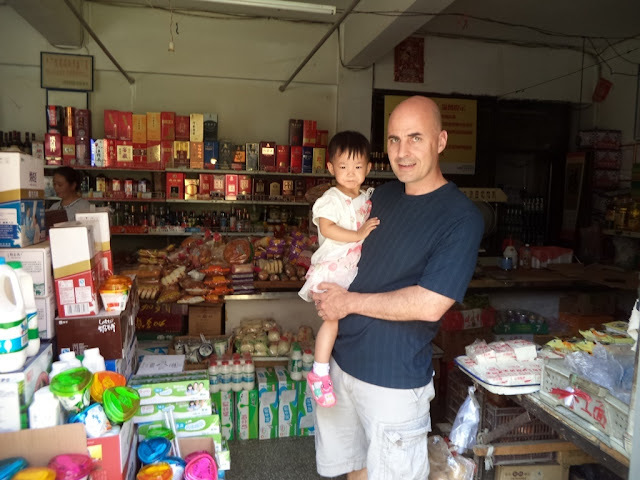 When the girls and I started giving her snacks and toys, she began to not be so afraid. Allan and I signed and stamped our thumb print on lots of paperwork. It was a crazy time of doing official stuff, trying to win over our new daughter, trying to capture all of it on memory, and keeping our eyes on our other children. 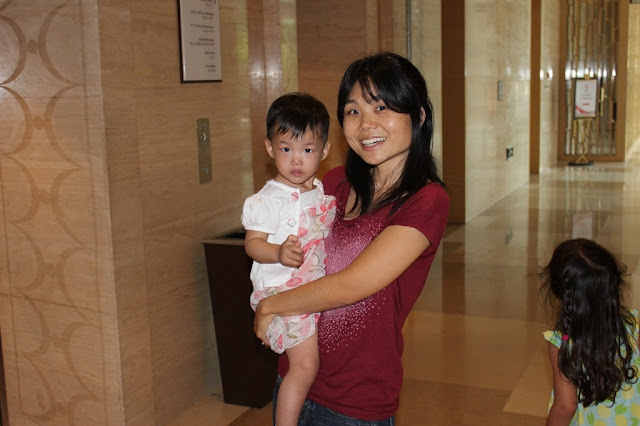 The international adoption lady took Siana to the restroom to get her diaper changed, and she asked me to come along. I could tell that Siana listened very well to the lady's instructions. I asked her if Siana talks a lot, and she told me she talks...but not a lot. I'm finding this to be true from Day 1. She has more of a quiet demeanor (unless she's just being shy). At some point during the commotion, Siana allowed me to hold her. She didn't seem scared of Daddy either. She did not make a peep when I handed her off to Daddy. It was time for the official camera guy to take a picture of all of us. This she did not like. She started crying and screaming, wanting to get out of our arms. She quickly calmed down afterwards. This is what the lady told us - she may cry a lot, but she will settle down quickly (especially when you give her snacks or when you take her outside). After the photo shoot drama, she never cried again on her first day with us (as of now; praying she sleeps through the night!). 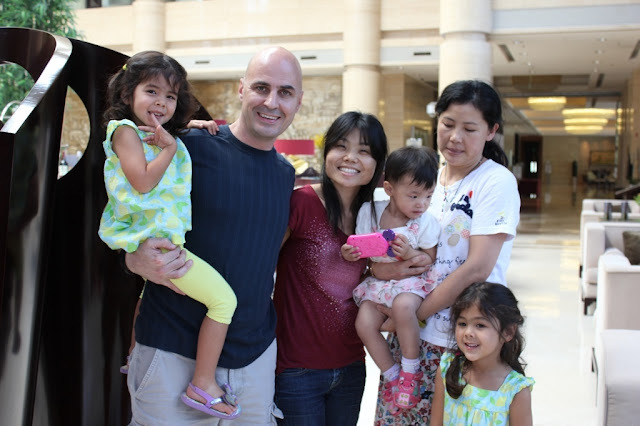 Here is the photo with all of us...unfortunately it's been hard to get Siana to look at the camera (but that's to be expected from a 2-yr-old). We said good-bye to Aggie and the lady (I really should have gotten her name) until tomorrow. As we walked over to the elevator with our new daughter in my arms, it was still surreal to me. We just went to the hotel lobby, did the exchange, and here we are - with our newest child. Simple as that. Crazy! Here's the first mommy-and-me photo. Let me tell you, she is a beauty! She will be breaking some hearts someday, I'm sure. We all played around in the hotel room for a while. 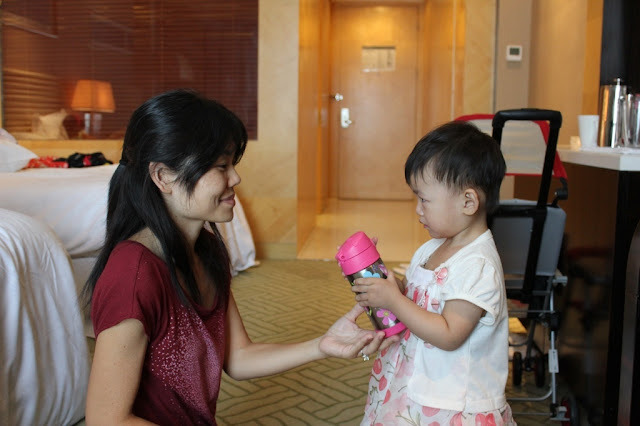 She was fascinated with the Minnie cup we gave her (it matches her two sisters' cups). She kept trying to figure out how to open and close it. This entertained her for a long time. She is an OBSERVER, just like Peanut. Her eyes kept following our every move, especially of the girls. I expect her to be smart just like our oldest. We took a walk to the grocery store. She LOVES being outside, again, just like Peanut. She starts giggling just feeling the wind blow on her face. As expected, the stroller we bought was quickly claimed by LittleBit. Which is fine, since carrying Siana will give us more opportunities to bond. 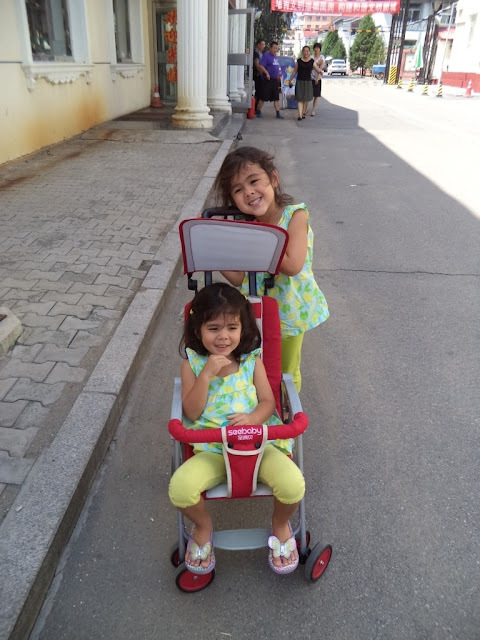 The stroller also helps to keep the other girls busy. Peanut had fun pushing the stroller around. 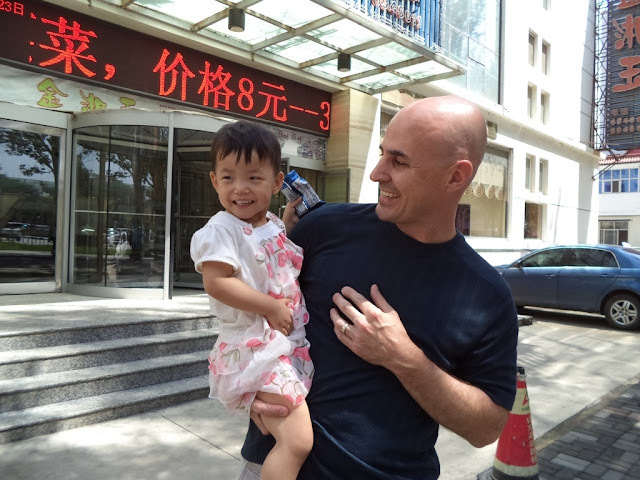 Siana had no trouble adjusting to "Baba" (Chinese for Daddy). But then, who can keep herself from smiling when she's with this guy? 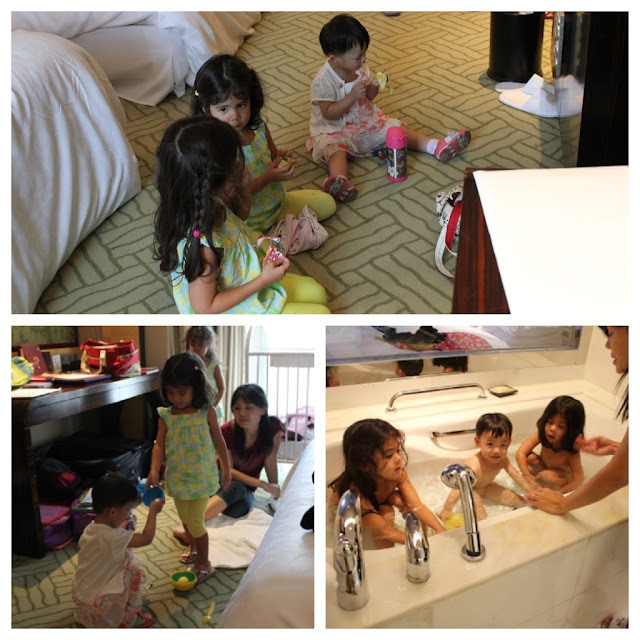 Siana enjoyed having lunch with her sisters and playing with them...and taking their first bath together. She squealed and giggled every time her sisters poured water over her head. 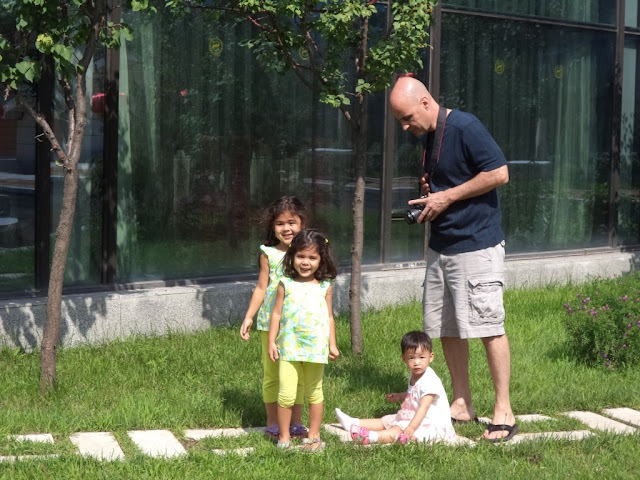 We also took a walk around the hotel garden...it gets really HOT in the middle of the day in Hohhot, but is very nice and cool for other times of the day. We decided to walk back to the Japanese restaurant for dinner. Again, she was instantly happier when she was outside. She's also very friendly. She loves to wave at people as we passed by them. If the person waved back, this made her extra giggly. She loves to give smiles. She has the sweetest voice. She seems to have such a happy temperament, which reminds me of how LittleBit was when she was a baby. At the Japanese restaurant was probably the toughest time we had today. If you know our family, you know that we like to keep things clean...especially during meals. Well Siana is a typical toddler who likes to just grab food and make a mess. She also got very impatient when the food came...she wanted to get her hands on them right away. We kept trying to tell her to wait, as some of the foods were really hot (i.e. noodle soup). When we finally were able to put some in her mouth, if she didn't like it, she'd again get impatient, take the bib off, and push the plate away from her. Meanwhile our other daughters were getting restless and going crazy at the same time. Each one had a need she was expressing, and we felt like we were trying to manage a zoo. At one point, Allan and I just looked at each other across the table and started laughing. 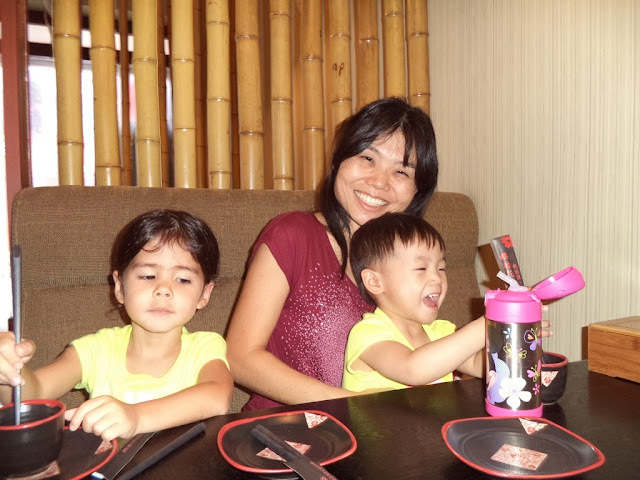 What were we thinking - bringing a 5-, 3-, and 2-yr-olds into a restaurant? I told him, "Hotel room service sounds good to me for tomorrow." His response, "I was wondering when you were going to come around to that." Siana kept trying to get down from her seat and was restless when she was sitting with me, but when I handed her off to Daddy, he was somehow able to work his magic. He taught her not to grab food but to wait for him to feed her. Things got much calmer after that. Siana loves saying little words that she knows, like "Mama" and "Bye-bye" and some other shorts words that I don't know. At first I thought she was already learning to call me Mama, but I realized that she was saying "Mama" to everyone and everything she passed by as she waved. She really is so, so sweet. During our walk back, she and I kept saying "mama" back and forth to each other. It's so easy to make her smile - I love it. LittleBit is definitely having some hard time. She loves Siana and loves bringing her toys, or trying to tease/play with her (she mainly copies whatever Peanut does with her). But she's also very clingy to whichever parent that's attending to Siana. She's throwing more mini-fits over little things and is not listening well at times. Please pray that she will adjust more and more to being a "big sister." We came home from dinner and played a little while longer, then it was time to get ready for bed. Siana is so easy-going and adaptable. She just goes right along with whatever's next...changing her diaper, brushing her teeth, changing into PJs, etc. After Allan brushed her teeth and took her shirt off, she came running to me with the biggest smile, ready to put her pajamas on. I think she has already learned the word "no" - I can tell that she understands me when I tell her not to do something (like bang on the window with her toy). But sometimes she'll try again. When I correct her again, she usually responds by smiling and saying "hehe" (like, "Just kidding, Mom!"). She's absolutely a doll. The international lady told us that we can give her either milk or formula at bedtime. We bought some milk at the grocery store. We tried giving it to her in a bottle but that wasn't going well. We gave it to her in a sippy cup and she drank it down. We put her in the crib and within 5 min she was asleep. That was a little past 7:30pm; please pray with us that she sleeps through the night! We could NOT believe how easy today was...except for the mini-challenge at the restaurant (which was totally to be expected). I'm sure there will be harder days ahead, but for now, I'm praising God for an unbelievably successful first day. I know that it has ALL to do with the many prayers we're covered by. I know that it has ALL to do with the message that Siana's life is meant to reflect...that our God is Gracious. Love from the Parrys, a family of FIVE. P.S. Here is one of the videos I was able to post...hoping to post more in the near future. Also, in case you're wondering, we haven't come up with a nickname yet. How about LuLu, or LuSi for a nickname?